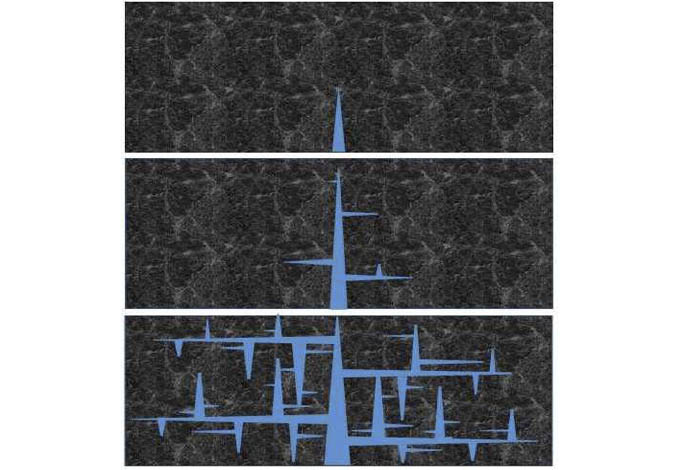 Los Alamos National Lab’s new computational model could potentially boost efficiencies and profits in natural gas production by better predicting previously hidden fracture mechanics. It also accurately accounts for the known amounts of gas released during the process. In the face of the industry’s immense growth and success, much of the fracking process remains mysterious. Because fracking happens deep underground, researchers cannot observe the fracture mechanism of how the gas is released from the shale. Branching into densely spaced hydraulic cracks is essential for effective gas or oil extraction from shale. It is suspected to occur, but the existing mathematical models and commercial software fail to predict it. A new paper from Northwestern University and Los Alamos National Laboratory presents a method to predict when the branching occurs, and how to control it. Image Credit: Los Alamos National Laboratory. Click image for the largest view. 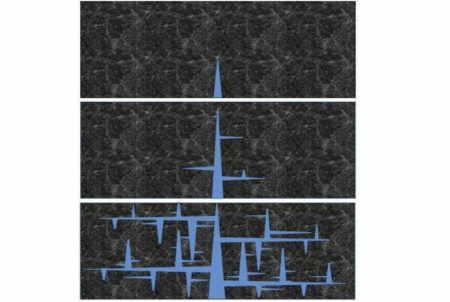 The results were published in the Proceedings of the National Academy of Sciences on January 11, in a paper titled Branching of Hydraulic Cracks in Gas or Oil Shale with Closed Natural Fractures: How to Master Permeability. Of note, this research was funded by the Laboratory Directed Research and Development program at Los Alamos National Laboratory, and the collaborating team at Los Alamos was funded by the U. S. Department of Energy’s Office of Science. Other authors of the paper include Saeed Rahimi-Aghdam, Hyunjin Lee, Weixin Li, and Hoang Nguyen of Northwestern, and Viet-Tuan Chau, Satish Karra, Esteban Rougier, Hari Viswanathan, and Gowri Srinivasan of Los Alamos National Laboratory. With 50 years of experience already in hand, a substantial amount of capital, and quite a large incentive this research is likely to find many homes for trials. Then, there will surely be an even larger base of knowhow. The U.S. is closing in on being the largest petroleum equivalent producer, again. With over 150 years of background and 10+ million staffers with some of the best engineering minds anywhere, oil and gas are sure to be used for a very long time to come. The green gang really has a problem pushing fossil fuels out of the economy. Petroleum products make a market that is nearly totally encompassing the world economy and nothing yet seems capable of making much of a dent. There are niches galore, that remain small and offer little to the billions of folks looking to stay warm, cool, get around, and secure the supplies of life at sensible prices. Technology will change the world. It has been over 2 years since the US oil industry drilled a dry hole. The technology is amazing.